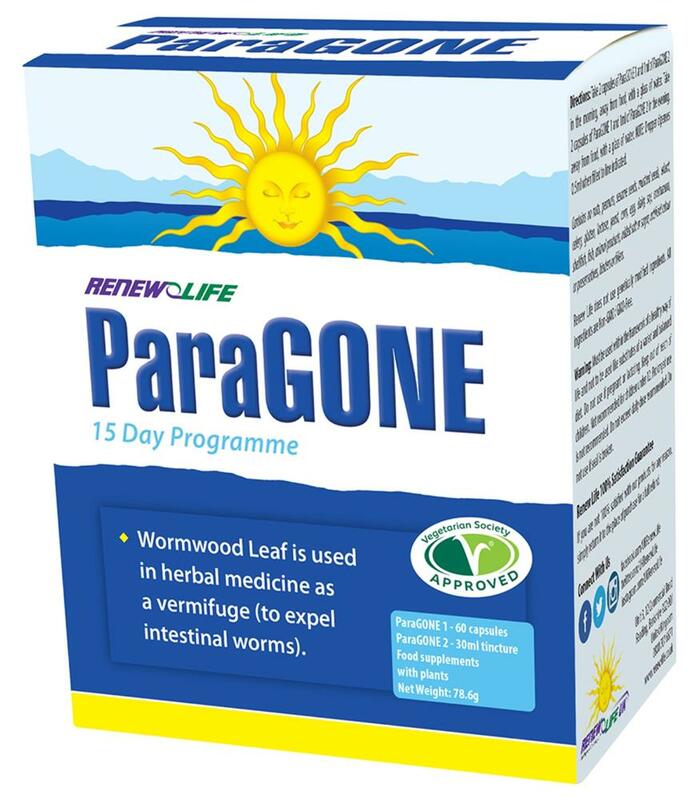 ParaGONE is a 15-day broad-spectrum antiparasitic, antimicrobial, and antifungal herbal cleansing program. It contains herbs and extracts that are widely used to remove both visual (nematode) and microscopic (bacterial) parasites from the body. It also contains antifungal herbs and extracts that are known to eliminate yeast/fungal organisms from the body. PLEASE NOTE: If you suffer from candida and yeast problems regularly, you will want to use CandiGONE and support products to fully eliminate this problem. Contains no peanuts, sesame seeds, mustard seeds, wheat, celery, gluten, lactose, yeast, corn, egg, dairy, soy, crustaceans, shellfish, fish, animal products, added salt or sugar, artificial colour or preservatives, binders or fillers. Take 2 capsules of ParaGONE 1 and 1ml of ParaGONE 2 in the morning on an empty stomach (30 minutes before eating). Take 2 capsules of ParaGONE 1 and 1ml of ParaGONE 2 in the evening on an empty stomach (2-3 hours after eating). Consume both the morning and evening doses with 1 cup of water. Take for 15 days, followed by a 5 day rest period, and then continue for an additional 15 day period as required (additional ParaGONE Kit required). This will ensure that any parasite larvae are also destroyed. PLEASE NOTE: ParaGONE II dropper dispenses 0.5ml when filled to line indicated. If you weigh less than 150 lb or are sensitive to medication in general, you may wish to take half the suggested dosage for 15 days (take only the evening dosage), followed by a 5 day rest period, and then continue for an additional 15 days at half the suggested dosage. PLEASE NOTE: Cleansing can be intense! If you have never cleansed before, or find that you have moderate to severe headaches, nausea, or diarrhea while doing this cleanse, then you may wish to perform the ParaGONE program at half the suggested dosage (take only the evening dosage). These symptoms may or may not appear depending on the severity of your condition, how well your body is performing its detoxification processes, or how strong your immune system is. Must be used within the framework of a healthy way of life and not to be used like substitutes of a varied and balanced diet. Do not use if pregnant or lactating. Consult a health care practitioner if symptoms persist. Keep out of reach of children. Do not exceed daily dose recommended. Do not use if seal is broken. Store in a dry place away from direct sunlight and heat.